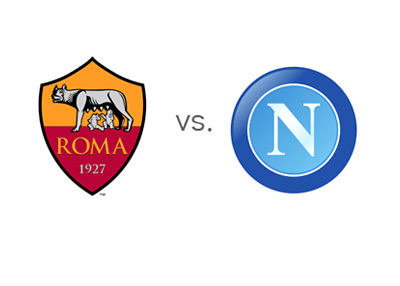 AS Roma will host Napoli in the eigth round of Italian Serie A on Friday, October 18th, 2013 at Stadio Olimpico in Rome. After seven matches played, AS Roma have seven wins and are at the top of the Serie A tables. The domestic league is the only focus for AS Roma this year and so far they have done an outstanding job, scoring 20 goals and conceding 1. Most recently, AS Roma beat Inter in Milan with the score of 0-3. A few weeks ago, AS Roma beat their city rivals, Lazio, 2-0. The Italian international, Alessandro Florenzi, is the leading scorer so far for the team with 4 goals. Napoli have also had an outstanding start to the season and are currently in second place with six wins and one draw. The biggest game so far in Serie A for Napoli was the 1-2 win vs. AC Milan. Napoli are also competing in the UEFA Champions League where they have so far beaten Borussia Dortmund at home and lost to Arsenal in London. Gonzalo Higuain, who missed out on the last two Napoli games, including the game in London vs. Arsenal due to injury, is likely to be featured vs. AS Roma. AS Roma are the slight favourites to win at home. A 100 € bet on the hosts could return 120 € in profit, while the same bet on Napoli could return 220 € in profit. Francesco Totti and Gonzalo Higuain, who have both scored 3 goals so far in Serie A this season, are the favourites to score on Friday, both valued at 8/5 (bet 100 € for a chance to profit 160 €).